C-Line's exclusive Do-It-Yourself Laminating Film lets you seal and protect your valuable or frequently handled documents with ease. Just peel off the split back liner and apply, it's truly that easy! No heat or special equipment is needed. The clear finish offers a sharp, transparent finish. It is perfect for showcasing your materials and makes presentations appear bold and bright. C-Line super heavyweight laminating sheets offer maximum durability plus outstanding performance in preserving and protecting high use presentation materials, letters and reports. The laminating film roll is capable to be cut to the exact size you need, allowing for do-it-yourself customization projects. You'll literally find hundreds of uses at the office, home or school. From phone lists, photos, maps and projects, to decorative pieces, Cleer Adheer is the choice for quick and easy laminating protection. Multiple sizes and formats meet your individual project's needs. Insert Size: 24 x 600"
Best laminate in the market!!! Good Deal Review by W.
We've been purchasing this same product from a more popular store/company at double the price of shoplet.com. Now that we know that we can purchase items through this website that we normally purchase elsewhere...we'll definitely consider checking prices here before defaulting to our regular ordering websites! !Shipping was quick as well....and the product works well for laminating school items as well as home projects. Paper back could use more perforations as smaller pieces got more difficult to remove. Welcome to MyBinding video. 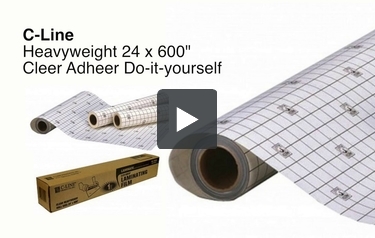 Let's roll out C-Line's Cleer Adheer Do-It-Yourself Adhesive Roll. This is one gigantic adhesive roll allowing you to laminate projects without a laminator. The simple, easy, built in grid pattern to make sure everything is nice and square, it is truly easy to make the perfect cut and the right sized sheets. This is custom protection in lamination at its finest. And with a full 50' of 24" wide material, you're going to cover a lot. Starter edges all around allow for peeling and sticking made easy. You won't even think twice if you choose to go double-sided. You can have the adhesive on the bottom or the project on the bottom. Either way, start it, line everything up according to grid, press it down. And once you have your lead, you masterfully pull away the grid and spread your project all the way to completion. It's what here at MyBinding we call the Slide & Smooth technique. Take your time as you learn how to do it, get out all the air bubbles, and you'll be pleased with the results. The final step is trimming. You can do that with scissors or cutting machine. You can also simply just fold back the adhesive to the back side of the project. And that's just about it. Oh did we mention how wide this is? 24" can cover a lot of ground. For more demos, reviews, and how-to's, check out MyBinding.com.